The definition of a global energy policy appears to be increasingly appropriate. Member States, which all share the same weaknesses, have enough in common to pool ideas about security of supply or how to overcome environmental challenges and stimulate competition. Although Community stakeholders have a vital role to play in combining best practices and taking the best advantage of the various types of approaches and specific national trends, a European framework must now be established in detail in order to correctly channel Member State initiatives and satisfy the need for transnational co-ordination. The creation of energy markets comprises the first step in rising to these challenges but is not enough to guarantee the development of energy infrastructure on which the goals of the European energy policy are based. As far as electricity is concerned, the technological structure of production capacity is vital to both limiting CO2 emissions and reducing primary energy requirements and costs. Over the next few years an opportunity to renew the current production and distribution infrastructure will arise. Forty years after the power station boom in Europe we are now entering the initial phase of a major upgrading of our installations. A truly European strategy involving industry leaders and public authorities seems vital if this opportunity is to be seized. 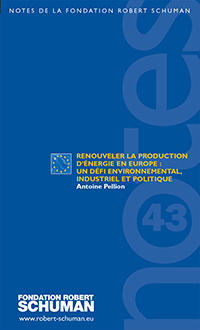 Although private stakeholders retain the greater share of the decision-making process in terms of new technology, public authorities have a vital role to play in reconciling industrial interests with environmental and public service requirements. They have the requisite means to guide the development of production facilities: they control the pace of power station closures by means of their regulation tools, they encourage investments by reducing long term risks and they can influence technological choices. Although national prerogatives still weigh heavily in these areas, the European Union must define framework guidelines to optimise and co-ordinate Member States' action. It has an essential role to play in boosting R&D, in defining the political and regulatory environment that is condusive to investment, and in stimulating competition. It must also drive the evaluation and acceptation of the various technologies, so that each Member State can best contribute to the European energy mix, without systematically opposing any given solution and whatever the preferences of each Member State in its own country. Civil Engineer from the Ecole des Mines - Paris, Student Engineer of the Corps des Mines. He also attended the Massachusetts Institute of Technology (MIT, US).